If your God is so smart, why doesn’t he speak my language? A sarcastic remark similar to this from a Cakchiquel man left a deep impression on a young American who was in Guatemala selling Spanish Bibles almost one hundred years ago. Today at least 200 million people around the world still ask this question that spurred Cameron Townsend to translate the New Testament into Cakchiquel and establish Wycliffe Bible Translators in 1942. Beginning in a Californian garage office and growing to a worldwide movement with headquarters in Singapore, the Wycliffe Global Alliance today is a group of like-minded organizations that share resources, strategic relationships and opportunities to serve together in God’s mission. 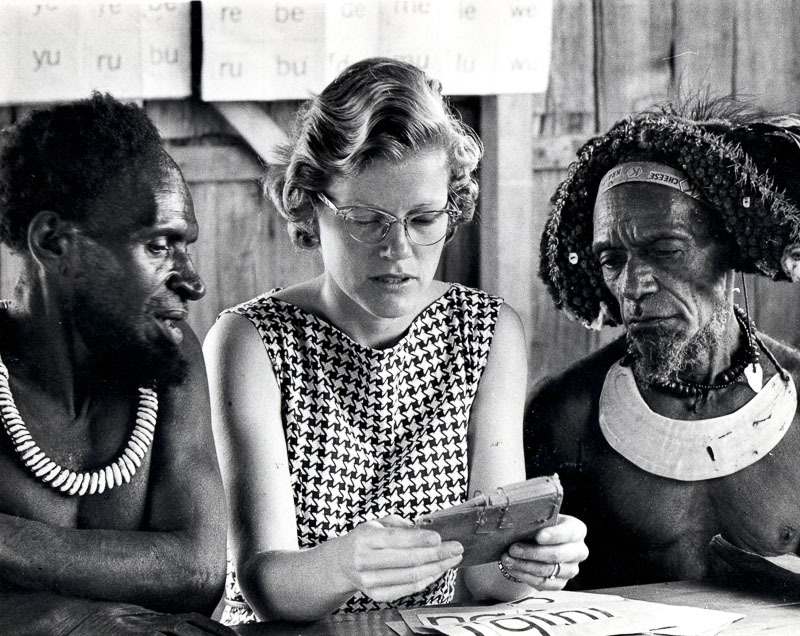 This gorgeous old photo of a literacy specialist working with two men in Papua New Guinea was probably taken in the 1970s and obviously much has changed since then. New Guineans rarely wear traditional dress every day, western women rarely wear curlers to bed and most of the translation and literacy work is done by those who know their own language best. Over the decades, as we’ve sought how to best serve those without access to Scripture, our methods have changed but our desire to help people understand God’s great love is still as strong as ever. Hi! I am making a video about bible translation and I’d love to use this picture if that is alright! Yes, you sure can! All the best.